Actually, I am curious as well. What did Ninoy actually do for the country? Take out his monologues and death (of which only an insane person will deny the country is divided about). For fairness, we’ll discount his suspicious absence in Plaza Miranda and his arguably treasonous Jabidah myth making. And let’s take out allegations of Japanese collaboration by his family, rumors of in-laws absconding with the Katipunan funds, and the fact that he was not a model student (kept transferring schools) and journalist (his editors say he was a terrible writer). So that’s quits. Ninoy was not the only political leader to be killed fighting Marcos: there were Edgar Jopson, Cesar Climaco, and Evelio Javier. For things built: the South and North Expressways, the C-5, and the present Manila International Airport were done during Marcos’s time, as well as our civil service and labor codes, all of which still benefit Filipinos today. Believe it or not, our military structure is still a remnant of Manuel Quezon’s creation. Senators have had lasting impacts: there’s the Recto and Maceda laws (on rent), the Lina Law (on squatters), and Pimentel’s (local government code). Lorenzo Tanada was a national team footballer that later prosecuted Japanese collaborators (which included Benigno Aquino Sr; as historical interest see gr. no. l-1243, April 1947) and also acted to have publication of laws implemented as part of due process. As opposition leaders, there were Gerry Roxas, Ben Diokno, Neptali Gonzales, Jovy Salonga, Aquilino Pimentel, Lorenzo Tanada, Doy Laurel, Ramon Mitra, Eva Kalaw, Tecla Ziga, Bono Adaza. Former Marcos guys Kit Tatad and Paeng Salas, then Arturo Tolentino. I grew up during the Martial Law years and I remember either having met or seen or currently read then all those capable men and women who fought, lived, and worked for democracy in our country. But for Ninoy, I can’t recall anything of lasting importance he actually did. The earliest memories I have of him are merely his videotaped political speeches or interviews circulated after his death. So, to sincerely and with all due respect ask: What law or measure has Ninoy Aquino done that actually, profoundly, and enduringly benefitted the Filipino as a united people and not just a certain sector thereof? Next Article Philippine poverty is really a very simple problem. It really is. What has Ninoy Aquino done that is comparable to Marcos only one – he got killed! Macoy was not killed. Ninoy was. But both died. There’s your comparison. Ninoy Aquino and Edgardo Anggara were both senators. Ninoy, seemingly, is “more popular” than Edgardo. – the National Health Insurance Act, or PHILHEALTH and others. – He became mayor of Concepci?n in 1955 at the age of 22. – the nation’s youngest vice-governor at 27. – Then secretary-general of the Liberal Party in 1966. – In 1967 he made history by becoming the youngest elected senator in the country’s history at age 34. But how was he as a senator? He was popular? with his speeches… speeches against Marcos! Curiously, Ninoy also has no profile entry in the senate website. Well. Those qualities surely made him qualified to be called a “hero.” There are ordinary citizens who have better achievements. That “Study Now Pay Later Plant” was not originally Ninoy’s. There was a claim that it was written by his then chief of staff, Raul Roco. Ninoy is surely a “hero” to some, especially to his immediate family. Macoy, too, is a hero to his immediate family (also to many supporters and admirers.) Family is family. It comes first. But the difference between the two figures is so huge one can only be blind, deaf and mute not to discern. And if achievements in public service are measures of heroism, then undoubtedly Macoy is undeniably it. I guess he wants our country to become the next Singapore for that one. So do you think Marcos is a hero, fighting Japanese guerilla and declaring Martial Law to prevent Communism takeover by getting dozens of war medals? Another troll post. If anything, the Red Scare is no mere scare during that time. Communist insurgency is rampant and they were serious of overthrowing the government. His World War II records is irrelevant and so does your shitposting. The Yellowtards’ story of Marcos’ fake war medals was concocted only in the ’80s. But it was something different back then that says a lot! Nice try, KRChronicle, go tell DIO that I post terrorist or ISIS comments not a troll post. Expect China to censor or remove the website! @KRChronicle, You are the one who’s shitposting. A yellowtroll at that. THIS is a fine example of shitposting from a yellowtroll like yourself. This must be the “wake up call” to all elected officials. What did you do, when you were in power, to make a difference in the lives of people ? Being in opposition, and dying for your being in opposition, will never make a difference in the lives of your constituents. Ninoy Aquino, Jr. did more harm than good in his tenure as a politician. His role in establishing the communist front: the New Peoples’ Army, has made many people killed , in the war of attrition with the Philippine government. Up to now, people are killed , for this false political ideology. I cannot think of anything good done by Ninoy Aquino, Jr. All that he had done, was for himself and his family. The Hacienda Luisita scam, was the worst, he had done. He stated: “Filipinos are worth dying for…”, after he was sentenced to death for rebellion and treason. The Roman Catholic Church, which was then headed by Cardinal Sin (he deserved his name as sin), supported him. Up to now, the heads of the church, support the Aquinos. Ninoy Aquino, Jr. was nothing but a narcissist, and the consummate political opportunist. He was worthy of dying for his own political ambition ! When you use the phrase “has done” it implies that the person is still alive doing things. He Has done XYZ so far, but he is still doing EFG for instance. The New Peoples’ Army was Ninoy Aquino , Jr. work. He had established it then, together with Jose Maria Sison and Bernabe Buscayno. His work is still affecting our country. So it is in the present tense. I maybe wrong grammatically, but, I want to emphasize it as a present threat. 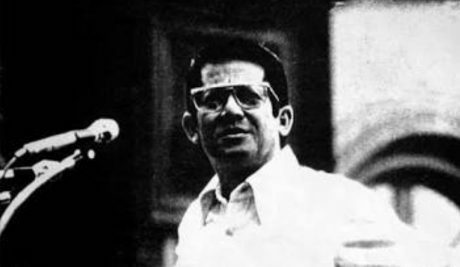 Ninoy Aquino was a founder of the Communist Party. He is no hero. He was the mastermind behind Marcos. Troll post right there. More like he had secret dealings with the Communist Party of the Philippines. More like he connected with the Left for his ambition. nice try but terrorist post. Nice try with your TROLL post, including your terrible grammar. Troll and terrorist posts lol. My posts are terrorist posts not troll posts. I am more of a yellow terrorist than a yellow troll. Not exactly. Because according to a study, internet trolls are known for being psychopaths, narcissists and sadists. They will LIE, OFFEND, and EXAGGERATE in order to get a response. What’s worse is that constant trolling would also result to bullying. So yeah, it’s hard to take you seriously because you’re a laughingstock. Take it seriously. Internet trolls can also be terrorists. This might be a worse case scenario as IS or ISIS are trolling and terrorizing people. Feel free to call me a yellowtard troll or terrorist or whatever. How about no? Because you’re too cowardly to pose yourself as a threat. It’s all attention whoring and that’s it. Again, there’s no need to tell us to feel free to call whatever you are because YOU are an internet troll. And that’s a fact. I am just an internet jihadist and terrorist more than internet troll who terrorizes more than bully. That’s a fact. Not only there are just internet trolls; there are also terrorists and jihadists like me, not you. What a yellowtard you are and what a yellowtard I am! There is no such thing as ‘internet jihadist and terrorist’. Only trolls. You blatantly lie on your teeth. You exaggerate everything and you offend everyone on this page with your blatant shitposting. Also, stop accusing me as a Yellowtard because your impersonations said so. You exposed yourself, son. did ninoy and cory knew these will happened when they’re still alive to their childrens? what the aquino-cojuangco clan did not achieved is to erase their false genea of being a traitor to thier own country. pnoy now in losing the ball. @MR FAROL, YOU REALLY HAVE TO ASK? Ninoy Aquino is the Philippines Nelson Mandela….imprisoned by a Dictator for his political beliefs. Freedom of conscience denied, he went to prison and was only let out due to a Heart Ailment. Marcos, what a guy, huh? Aquino represented, GLOBALLY, what people around the world lONGED FOR, TO live in, A FREE AND DEMOCRATIC SOCIETY, NOT IN A TYRANY DRIVEN DICTATORSHIP, which is what the Philippines had become under Marcos and his cronies.Dont mistake what happened after his MURDER (at the hands of the CIA ) as what would have transpired had he lived either. SO, BEFORE YOU PUT YOUR TONGUE IN YOUR CHEEK AND ASK SUCH A STOOPID QUESTION, TAKE A LOOK OUTSIDE YOUR OWN BACKYARD FOR A CHANGE AND TAKE A LOOK AT THINGS FROM A GLOBAL PERSPECTIVE. YOU WILL GET A BETTER VIEW.